SuchApp – Blockchain-enabled, multi-channel messaging platform. Today’s messaging apps are fundamentally anchored to a very limited paradigm of one-on-one conversaBons and small unstructured groups. Largely, they fail to provide the necessary tools required to foster community, sBmulate economic acBvity and encourage lively human interacBon. The social media/messaging industry now represents $90 billion worldwide and is expected to grow to over $120 billion by 2020. However, the funcBonality that is offered to their 3 billion users leaves much to be desired. 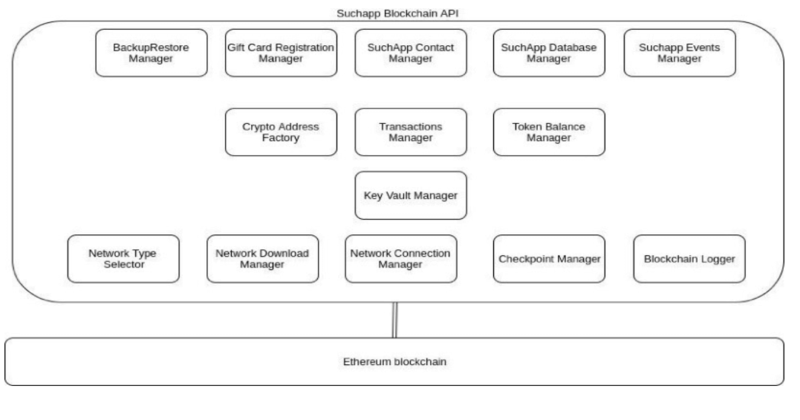 With a prepared rollout scheduled for 178 countries and 16 planned localized versions of the app, SuchApp will provide a new, full-featured messaging ecosystem based on blockchain technology. The app which will enter into public alpha in January 2018, not only provides realBme messaging but incorporates powerful new features such as locaBon based messaging, 4K broadcast video, granular security and powerful community and business communicaBons capabiliBes. Thanks to the integrated cryptocurrency ecosphere based on our ERC20-based SPS token, users will be able to buy, sell and trade all types of assets and services directly from within the app. AddiBonally, anyone in the world can create and administer a group on SuchApp leveraging advanced community features such as a custom loyalty program based on the integrated token. Unlike most iniBal coin offerings, SuchApp is far from an abstract project waiBng to be commenced. Thanks to over $1.5 million already invested in development, the applicaBon is nearly ready to launch globally to the public. Our goal is to posiBon ourselves as one of the top 5 messaging apps in the world within 5 years. To accomplish this we will uBlize the funds raised in our iniBal token sale to catapult our user growth through strategic acquisiBons and sustained organic promoBon. SuchApp will soon announce an iniBal public crowdsale of its SPS token. The total supply of tokens will be 2.5 billion with a maximum fundraise of $40 million. The ICO price of each token will be $0.05. Pre-sale phase parBcipants will receive, in addiBon to significantly discounted token prices, lifeBme Gold Membership within the applicaBon. The social media and messaging industry now represents $90 billion worldwide and is expected to grow to over $120 billion by 2020. However, the funcBonality that is offered to their 3 billion users leaves much to be desired. With a prepared rollout scheduled for 178 countries and 16 planned localized versions, SuchApp will provide a new, full-featured messaging ecosystem based on blockchain technology. With SuchApp, anyone in the world can create and administer a group on SuchApp leveraging advanced community features such as a custom loyalty program based on the integrated SPS cryptocurrency token. Group administrators will be able to culMvate a direct relaMonship with their customers and can offer them uniquely targeted promoMons. SuchApp, includes an open searchable marketplace built over a robust blockchain ecosphere. This will bring excepMonal value to endusers, community organizers and businesses alike. Our goal is to bring on board more than 400 million active users in the next 5 years. From one easy-to-use app users will be converMng their smartphones into a single point of contact for talking to friends; socializing and networking with like-minded people; buying, selling and trading goods and services and making payments with our own digital currency. This is SUCHAPP. SuchApp’s uMlity SP Coin (SPS) provides a combinaMon of Digital Currency and bonus-based loyalty plan features. It is built on the Ethereum Plakorm making the integraMon with the blockchain community smooth and simple. SuchApp is not an early stage conceptual design. Instead, our mobile applicaMon is already in an advanced technical development stage. We have a proven development team working on it and will be entering our alpha testing stage in January, 2018. The business development strategy explained in this white paper is also well on its way towards full implementation. However, to reach our goal of becoming one of the top 5 messaging apps in the world much more will be needed. We are not too shy to put the actual figure we need to raise on the 1st page of our white paper. Our markeMng target is to become the messenger of choice for the blockchain community and our business target is to enter the top-5 list among Messaging ApplicaMons, measured by acMve users within 5 years. By that Mme, the market will be worth over $120 billion, and we will be strategically placed to act as a market leader thanks to the goodwill of the blockchain community and our loyal supporters across the world. To achieve the targeted growth strategy, we will need to invest considerably into both organic user growth as well as execuMng a well planned acquisiMon strategy. We also plan to conMnue developing our applicaMon, adding features and integraMng it even more Mghtly into the blockchain. It is not a secret that most of the messaging apps are cash-negaMve during the first few years of operaMons; and we must have enough cash on hand to finance our longterm strategic goals. WHAT WILL TOKEN SALE PARTICIPANTS RECEIVE? First and foremost, token sale parMcipants will be acquiring SPS tokens at their iniMal highly discounted price. It will serve as the basis of all product and service purchases within the applicaMon. It will serve as measurement token of all SuchApp loyalty programs. It will serve as the exchange mechanism between all user-created loyalty programs. In addiMon to these inherent uMliMes, we are offering lifeMme Gold Membership Levels to all the original qualified investors. This means that you will be rewarded with certain in-app services for free for as long as your account stays acMve.